Between 1982 and 2004 we completed thousands of land surveys. Beginning in 2004 we began to concentrate our surveying efforts on boundary disputes and surveys associated with forensic engineering. One of our boundary dispute cases gained national attention and was recognized by Point of Beginning Magazine. Click the highlighted text to view the article. We are active in numerous boundary dispute cases, including some that are related to state water bottom claims and mineral ownership in the Haynesville Shale in northwest Louisiana. 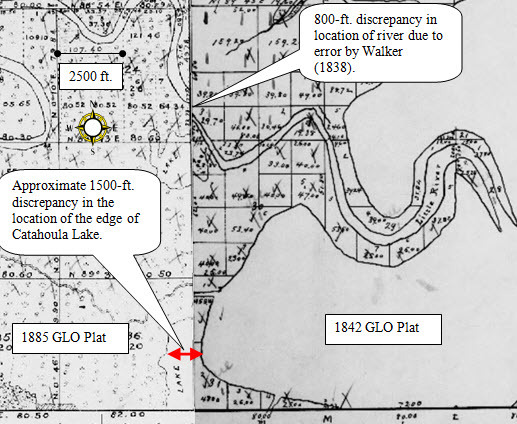 Click here to read the District Court ruling on the Rapides--Grant Parish Boundary Dispute, which gained national attention. Click here to read the Appellate Court rulings which affirmed the District Court Rulings.